Iter Vehemens ad Necem (meaning "violent way to death," but better known as IVAN) is a graphical roguelike game by Finnish developers which mixes addictive gameplay with brilliant humor and a lot of violence. Graphics and easy interface make it a good game for beginners, but completing the game is very hard due to unpredictable and dangerous situations that the game throws at the player. The game was abandoned by the original dev team in 2004, but since 2015 development is once again underway with new team of developers. Game includes body parts but only for humanoids. Yes, in IVAN you can lose your arm. This is far from game over though. You can have it reattached. Sometimes you will leave a leg to hungry lion and flee with rest of your body. This situation can be remedied by finding new limb. Do this by taking it from a poor unsuspecting monster or have it summoned by a god pleased with you. Limbs are replaceable but if hit points in your head, chest or groin reach zero you are dead. Sirens can turn even your angels against you. Each item is defined to be composed of one or two materials. Pine spear with iron tip, steel mace with fir handle or copper short sword with bronze hilt are all possible combinations. Double material property is also used to code many containers. Can of pepsi is an iron can with second substance set to pepsi. One very interesting and valuable item is Scroll of Change Material. It is so useful developers made wishing engine recognize "SoCM" as a valid phrase. As name suggest this magical trinket is able to turn material an item is made of to something else. There is intelligence stat requirement to make this feature balanced. Even better, your own body parts are also considered items as far as changing their material goes... Yes, you can have an adamantine arm. IVAN features fifteen gods of varying alignments (from extremely lawful to extremely chaotic). Player character may establish relationship with any deity. 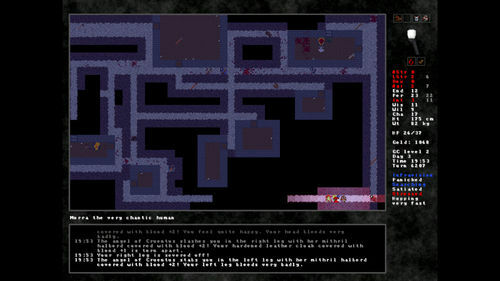 Unlike most other roguelike games it is possible to pray regardless of alignment. However, to do so one must first know correct rituals. Those can be learned by reading a holy book or by visiting dedicated altar. Offering sacrifices increases relationship with gods. There exist certain items and substances which raise standing with given deity more than others. Besides the body part system, the material system and the religion system, there are such curiosities as 2x2 monsters, wandering mercenaries and slaves which you can recruit/buy, smiths and tailors who can repair broken equipment, and monsters which are able to reproduce. And on the top of all that, IVAN’s storyline will keep you pumped with its unique events, and includes two main quests you can pick from each game, a handful of side-quests and several hidden minibosses. This page was last modified on 19 February 2019, at 19:16. This page has been accessed 98,702 times.